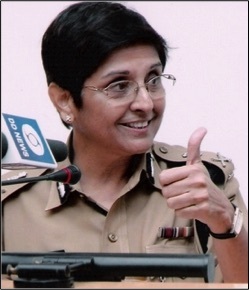 The first woman officer to join the Indian Police Service in 1972, Kiran Bedi pioneered innovative and humanitarian policing, transforming Indian prisons and boldly reducing corruption. Dr. Bedi has represented India in numerous international forums, received the prestigious Magsaysay Award, and is the subject of the 2009 film Yes Madam, Sir. Dr. Bedi also started two non-profit organizations dedicated to prison reform, drug abuse prevention, child welfare and preventive policing.